The answer is yes, if you’re wondering. Today I want to talk to you about using your existing clients to get new ones. That’s fabulous. That is ideal because then you don’t have to make so much effort. So let me tell you how. Unfortunately, you are going to have to talk to them. Yeah, yeah, yeah, I know. But that’s life. So the first way is to ask your top clients, so first of all let me just qualify. Some of you maybe in businesses where you only have 3 awful clients. Others maybe in business where you have a hundred clients. And you do all of them every so and often. But no matter what, you will have top clients and you will have less brilliant clients. So when we talk to them, you want opinion of top clients. So I want you to talk to them, and to ask them questions about the service that you give. Now you may say, well how can that get me new clients? Because if you can improve your service and give exactly what your client wants rather than what you want to give them, then this may come as no surprise to you, but that will be quite popular. And what will happen is 1) your existing clients will think they are wonderful because they had all suggestions that you took up. They will also think you’re wonderful because you did what they suggested. And they’ll go and tell their friends how wonderful you are. And also your reputation will spread because your service and your product will improve. No brainer, yeah? Second one, so you get this. Do I have to, ah do I have to tell you what kind of things to ask them? So yeah, don’t ask them ‘Oh what’s your age? Where do you like eating, do you like drinking coffee’ or whatever, unless it’s pertinent to your product. But quite simply, ask them. Why did they come to you? Ask them who else might they have gone to. Well who is their second choice? What made the difference? What would you prefer? What would they prefer that you did or did slightly differently? And remember don’t say I’m surveying customers because that just makes them just one of the number. You’re talking to them individually. Say George, can I come and visit you? Can I come and visit you and have, just grab a 5 minutes of your time, for a cup of coffee. Because I need your help in something. Who isn’t going to say, yeah sure? They might say, oh I’m a bit busy, I’m going on a little holiday. When would be a good time George? Next week. Thursday. Can I meet you for lunch? Can we meet? Yeah. Okay? Just basic stuff. Do not be scared of what they are going to say. 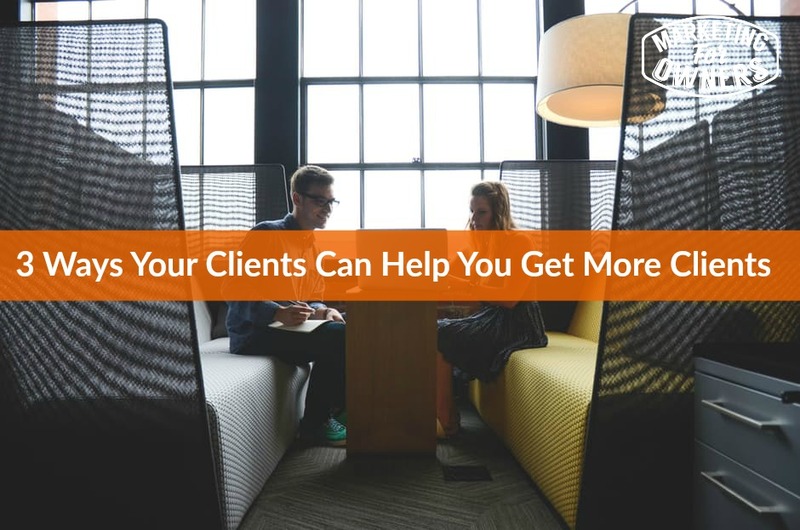 Remember, another reason for asking good clients is because they like you. They are not leaving. They are not disgusted, they are not complaining. And if they have complaints, ask them to give you. Say, what is your biggest complaint? I know you might not complaint. What would it be if I said, if I forced you to tell me what’s your biggest complain about us. What is it? And then if you find that everyone has the same complaint, I mean maybe it’s Margery who answers the phone, who coughs on the phone, or who puts someone old straightaway or who knows. Or the delivery driver. Or something, or the paper you use is so thick, it doesn’t store in, or it’s the wrong size. And it doesn’t go in their envelopes. Or it really could be something really simple. Okay. This is sort of obvious but the way I recommend you do this, is that you don’t ask for referrals before they’ve spent money with you. You do not ask for referrals when they have spent money with you one time. And you only ask for referrals when they have spent money with you at least twice. Preferably 3 times. But of course if it’s a longer term. You know then, whatever. But if you have just a small number of clients, they will spend money, I assume you build them monthly or something. So 2 months is a good time. Okay after that, now it is a good time to peg that on the end of those questions. Right so when they’ve ask those, say just out of interest who else do you think would be, would like this, would be good? And you can say I’ve got, we’ve got a client who’s finished their contract. We are going to need, you know we’ve got space to take on one more. Make scarcity. Who would be a good fit. Of course I’ll give, you know, I’ll give them a special deal, the same as you, etc. can you recommend someone and just directly ask for a referral. Don’t send them a card, don’t get some company to phone them up and survey them, and all that. Do it yourself. Please. Okay. That’s easy. So I don’t need to explain that anymore, do I? Surely Yeah. Talk to them. This could be at another meeting. Of course you could speak to them every 6 months or so. I assume that you speak to them quite often. Or you have reps. It doesn’t have to be you, it can be your rep, the person who has a relationship with them. No don’t giggle, no we are not talking about that. You know what I mean. The one in your company that’s their mate. They are the best place to be getting this kind of stuff. having a, I mean they might, who knows they might be going out for a crafty cigarette or whatever going downtown, going down the pub after maybe they know them to ask these things, but to write this down. This is not a casual conversation, it’s a casual conversation but this needs to be written down. This is casual formal. Whatever that means. Is there such a thing? So this one, you are going to ask them about your new products and services. So if you have a new product coming out, or a new service, I want you to go to your top handfuls, say your top 5 clients, and to say, ‘please do not let anyone know about this but because you are one of my top clients. Tell them about it. Don’t, you can get them to sign an NDA or something but it’s hardly a casual conversation, is it? I mean if this is obviously your latest rocket, the one that’s going to take people to Mars or something like that. Then you probably want to take them to sign that NDA. But everything else. Yeah it’s not like Rocket Science. Ha ha ha. But ask them what they think of it. And ask what would they improve. What would they do differently or what would they rather have other than that. Because generally we develop things that we think the clients will want. Quite often the clients wants something else completely. If you follow the lean startup method which is a book by Eric Ries. Companies get stuff to market very quickly. And then no matter if it’s not working properly. Generally in software and then they iterate. They can, they get customer feedback and they iterate many times a day. They, instead of putting out there like Microsoft and say oh what’s wrong, they stick it out when they know it doesn’t work and ask for people’s feedback. So they fix it. And generally what happens is the stuff in a completely different direction because what the clients want was something else. Not what you thought. And it ends up as a different product with you know, the same underlying thing. But for a different purpose. So cut out the middle man and just go to them and ask them before you even waste money trying to market it. Okay? Anyway that’s it. You can figure that out. Its good stuff this. Book for the week. This week is by Brian Tracy. It’s ‘Eat that Frog’. This is a very short book. This is one of the most telling books of all. Time Management, Organization, Productivity, Effectiveness, Getting stuff done. 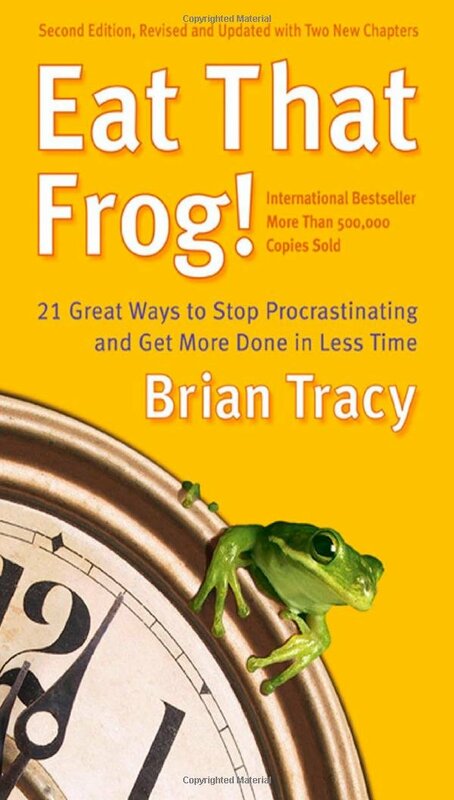 Just read Eat that Frog by Brian Tracy. Explains it all. You’ll love it. I’ll be back with more tips tomorrow.